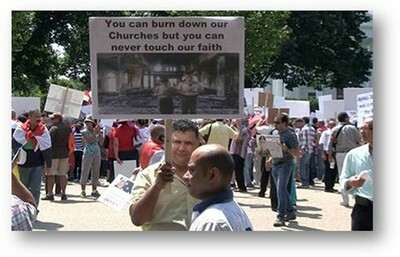 Hundreds of Egyptians – Christian and Muslim alike – gathered outside the White House Thursday afternoon to call attention to the plight of Coptic Christians and denounce what they see as the Obama administration's tepid response to a recent spate of church burnings. "Down, Down with Ikhwan!" they chanted in reference to the Muslim Brotherhood. Since Egypt's army cracked down on Muslim Brotherhood protesters, the Islamist group and its supporters have torched dozens of churches and attacked Christians. Muslim women in hijabs could be seen mingling among their Christian neighbors and joining in the chants. Protesters later marched to the headquarters of the Washington Post and CNN to express anger at the lack of coverage given to the attacks on Egyptian Christians. Then they went to the Council on American Islamic Relations' (CAIR) headquarters. Protest organizers consider CAIR to be the Muslim Brotherhood's "embassy" in Washington. The sight of hundreds of angry protesters outside its building prompted the Washington Post to lock down its lobby. Protesters defended the Egyptian military's decision to forcefully clear out the Muslim Brotherhood protesters staging sit-ins in Cairo, and they chided the Obama administration for condemning the military's action. "Egypt right now is dealing with terrorists," said protester Sherif Mina. "I mean, he's talking about peaceful demonstrations in Egypt by the Muslim Brotherhood. Is it peaceful when you carry machine guns, and artillery weapons – and all these kinds of torture that they've done to the Egyptian people, and the neighborhoods that they were sitting in?" Secretary of State John Kerry acknowledged the popular Egyptian belief that the military intervened at the request of the people. But talk of cutting off U.S. aid in the wake of the army's crackdown – in which hundreds were killed – seems to have reinforced protesters' perceptions that the Obama administration has sided with the Brotherhood. Many Egyptians now consider the Muslim Brotherhood to be a terrorist organization that destroyed the fabric of Egyptian society during its year in power, protesters said. That belief was proven by street protests against President Mohamed Morsi – the Muslim Brotherhood's candidate – which drew an estimated 30 million Egyptians. American foreign policy should back the majority of Egyptians who do not want the Muslim Brotherhood back, protesters said. They also called for a secular, free and democratic Egypt. Basic necessities became scarce under Muslim Brotherhood rule, electricity became sporadic, gas lines were common, and poor Egyptians were being hurt by the declining value of the Egyptian Pound by the time 30 million Egyptians took to the streets to say they had enough. As the army violently clamped down, Islamists turned to Egypt's Christian minority as easy scapegoats or accused the military of promoting "Islamophobia." But that didn't fly with Muslims who joined Thursday's protest in Washington. "All of the Egyptians they are found the Muslim Brotherhood they are just failures and liars about everything they are told us they will do it in my country," said Nessma Salem, an Egyptian Muslim woman who came from New York to attend the rally. "Unfortunately they make a lot of other things. They don't want to even admit they are liars. So the problem is all the Muslims, and all the Christians, and all of the Egyptian people they are just go to all of the street again after two years. They told us they do not want the Muslim Brotherhood to control the whole country again because they are failures and unfortunately they are support definitely terrorists." Other protesters shared her angst about the damage done to Egypt's economy under Muslim Brotherhood rule. Given the massive popular outcry, Morsi's removal from office was not a coup.
" million people came out in the street saying we don't want this regime. It's a terror regime – a terrorist regime killing everyone," said protester Fred Soliman. "They tried to rule the country by themselves and not share it with anyone else, so the whole country, the whole country  million people all over Egypt. They say no to that regime." President Obama has not mentioned Coptic Christians by name since the violence began. The closest he came was a brief, veiled reference to churches being attacked by Islamists last week. "We call on those who are protesting to do so peacefully and condemn the attacks that we've seen by protesters, including on churches," he said. The State Department has issued several statements condemning the attacks on the over 60 churches over the past week, but the Copts feel these statements have not been forceful enough. These tepid statements, together with the perception that the Obama administration was excessively deferential to the Muslim Brotherhood while they were in power, fueled their resentment. "We as the Coptic Christians of Egypt would like to live in peace, would like the Egyptians to decide their future. We don't want anyone to interfere in our future, would like the American government as well to the media to listen to all of the parties and to decide it by themselves," said Fr. Mikhail E. Mikhail of St. Mark Coptic Orthodox Church in Seven Hills, Ohio. "...We are here to say that what happened in Egypt is a revolution from the people, not a military rebellion." "The army is not going to rule in Egypt," Mikhail said. "They chose a Supreme Court judge to be in the transition period, and at the same time they have a plan to give it to a civilian government. We want Egypt to be civilian and for Egypt to separate between religion and state like you do here in the United States of America." Is there any way to sign a petition note for congress in regard this issue? I will be happy to sign a petition for them. The billions the Saudis and other petrodollar rich tyrannical Gulf dynasties give to the military in Egypt translate to Islamization of Egypt and war against non-Muslims. The West has the best opportunity for the first time in Arab history to invest in democratic institutions and embrace people who share our values, but failed to act. Regardless of what the anti democracy, social justice and religious freedom do, the Arab revolt against religious and political tyrannies are irreversible, despite wrenching impediments and costly setbacks. Mass revolutions are long, bloody and costly, especially when anti human dignity are rich and have support from countries that ought to reject their ultimate objectives: destruction of the right of the individual to choose.